In 2006 the Anglo Rug Deck was introduced to the magic community at the FISM World Championship of Magic held in Stockholm, Sweden. 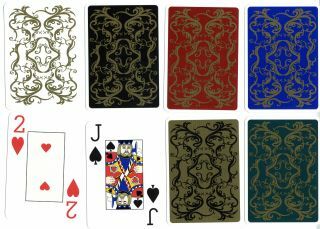 They were instantly loved by many magicians and card fans (no pun intended) for their attractive back designs, good quality card stock and smooth finish. They are availabale in six different backdesigns: black on gold, gold on black, gold on white, gold on red, gold on green and gold on blue. This card stock is a bit more stiff and a bit more hard, compared to the Anglo Poker Edition09, but still springy and smooth.